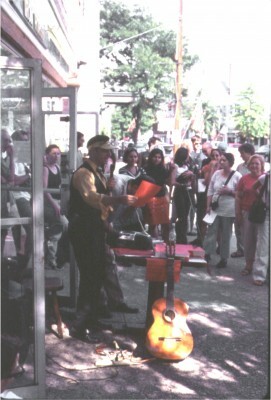 The Pablo Helguera Singing Telegram Show was a project designed to engage the general passersby audiences from the town of Brewster, as part of a weekend series of art interventions entitled The Brewster Project, in 2001. The project consisted in the presentation of a small stand outside of a local bar, in the form of an old-time Western Union telegram service center, where I stood with a speakerphone, a boom box, a guitar, a number of phone cards, and a menu of songs with message forms to be filled out by anyone- offering to deliver free sung telegrams over the phone, anywhere in the world. Visitors could choose a song and also request specific messages to be inserted into the song. This project became a major attraction to local residents, some of which sent telegrams to their next-door neighbor, and others requesting calls as far as Shanghai and Belgrade. Originally scheduled for only one or two hours, I kept fulfilling message requests for as long as seven hours. That Christmas I was invited by the town to present this performance again.